Air Mauritius joins fellow Vanilla Islands carriers that are restructuring their operations largely as a result of decreased demand from mainstay European markets undergoing economic turmoil. The Vanilla Islands – comprising La Reunion, Madagascar, Mauritius and the Seychelles – have already seen restructures from Air Austral in La Reunion, Air Madagascar and Air Seychelles. Air Mauritius’ plan, the last outstanding expected restructure, will see its European presence consolidated while efforts are renewed to expand to the potentially stronger but still nascent Asian market. Air Mauritius also aims to acquire a “more efficient” Airbus fleet – an objective common in a region typically operating older aircraft – and possibly entering a strategic partnership, following Etihad’s Jan-2012 stake in Air Seychelles. Although Air Mauritius’ traditional markets are proving volatile amidst the ongoing economic crisis, they are still the carrier’s largest and are important for trade and diaspora connections. While the carrier is finally acting on its plans to turn to emerging markets, it is not yet prepared to let go of its traditional roots. Air Mauritius’ network restructure includes the end of select services to Europe, the Indian sub-continent and Southern Africa. While the carrier plans to cut seven routes, it will reinforce 17 others, including Paris Charles De Gaulle (CDG), London Heathrow, Kuala Lumpur, Singapore, Perth and Johannesburg. Air Mauritius stated its long-haul routes served by one or two weekly frequencies will be scrapped in favour of services where the carrier can offer more services or open new routes. Air Mauritius' capacity is currently concentrated heavily in Western Europe with 34.8% of all services deployed operating to the region. 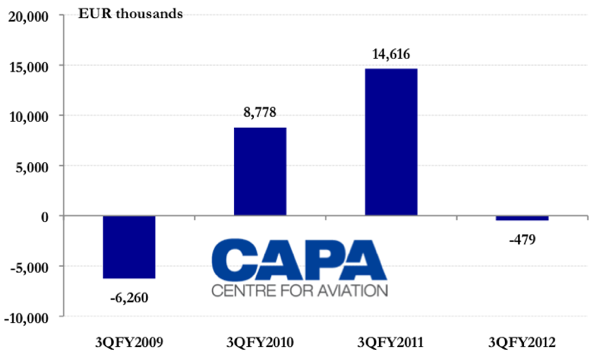 Asia Pacific accounts for 32.4% of the carrier's total capacity, with Southeast Asia accounting for 13.5% of total capacity. Only 11 other carriers serve Mauritius’ Sir Seewoosagur Ramgoolam International Airport. Air Mauritius’ suspended European services can be picked up by Emirates or the European network carriers serving the country: Air France and British Airways. Condor, Corsairfly and Meridiana Fly can pick up limited destinations. Sydney and Melbourne will not have replacement services, although passengers can take interline domestic flights to Perth, a destination Air Mauritius will maintain. Bangalore will be left to Emirates via Dubai while South African Airways can provide connections to Durban. Air Mauritius plans to reinforce particular destinations in its network, including links to its strongest European markets (Paris CDG and London Heathrow), regional routes (La Reunion, South Africa and Madagascar) and emerging trade routes (such as Kuala Lumpur, Hong Kong, Shanghai, Singapore and India). 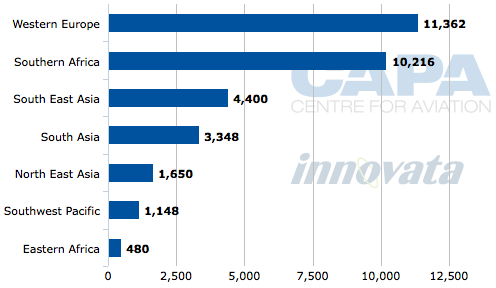 The carrier has not yet confirmed new frequencies for these services except for Mauritius-Perth, which will increase from weekly to twice weekly in Jun-2012. Mauritius experienced a slump in tourism arrivals in 2009 from all major markets due to the GFC, however, these numbers picked up in 2010 and all markets are projected to show recovery in 2011, in which data has not yet been released. The country’s fastest growing tourism markets include India, Singapore, Malaysia, the UAE and China, which only just reported arrivals in 2010 due to the launch of Air Mauritius’ service to Shanghai. India is fast becoming a focal point for the Mauritius Tourism Promotion Authority (MTPA) with the organisation aiming to increase its annual tourist arrivals from India to 100,000 p/a by 2015. Mauritius has traditionally been a high-end tourism market and the MTPA believes the average Indian daily spending could reach USD360 per day (considering travel, accommodation, food and spending). Air Mauritius has expressed an interest in forming a partnership, which may see it take a similar line as Air Seychelles, which entered a strategic partnership with Eithad Airways in Jan-2012. Etihad’s investment in Air Seychelles, which includes a 40% ownership stake and a USD20 million cash injection, is a new lease of life for the island carrier. A month prior in Dec-2011, Air Seychelles announced it would cut all long-haul services. Air Mauritius’ codeshare partners include Air India, Egyptair, Kenya Airways, Lufthansa, Malaysia Airlines and Air France. Considering Air Mauritius’ traditional European focus, Air France has been its most important codeshare partner, allowing Air Mauritius to offer 18 weekly services to Paris CDG, as well as reaching destinations in Spain, another important trading partner. In seeking a partner, Air Mauritius joins a growing list of carriers, predominately in Europe, seeking a saviour, of which there are far fewer. The Etihad-Air Seychelles deal had many unique factors that mean such a deal cannot necessarily be easily replicated with Air Mauritius. First, Air Seychelles was on the brink of collapse, cutting its long-haul route network and only serving two regional points. It had gone through numerous CEOs in a handful of years. Potential partners want to reap benefits and not be silent investors; Etihad’s agreement with Air Seychelles gives it network access. Owners of a faltering carrier are much more agreeable to a partner’s terms than are the owners of a carrier experiencing turbulent times but not fearing collapse. Air Mauritius previously forecast a full-year profit, a scenario unfathomable to the more struggling Air Seychelles. Etihad also sees the Seychelles, off the cost of eastern Africa, providing a geographically advantaged hub for flights between Africa and China, a market that is steadily growing. (Africa will be the largest growth market for Asia in terms of per cent.) Mauritius, off the southern coast of Africa, provides fewer potential hub opportunities; it is effectively an end-of-the-line carrier. The destinations Air Mauritius plans to strengthen are major trade partners of Mauritius including India, China, South Africa and Australia. Although European countries such as France and the UK are major import and export partners of Mauritius, the volatility of their markets and current debt crisis are forcing Mauritius to look to other trade sources. While the country’s main export partners remain fairly traditional (Spain, France, UK, US, Madagascar, Italy and South Africa), its import partners have diversified to include India, China and Japan as major partners. Mauritius’ main import commodities include manufactured goods, capital equipment, foodstuffs, petroleum products and chemicals. This major restructure was prompted by the carrier’s poor 3QFY2012 results, which saw Air Mauritius report a net loss of EUR2.8 million compared to a profit of EUR12.6 million p-c-p. The carrier blamed the euro zone crisis, economic “turmoil” in its main markets and rising fuel costs for creating a “highly challenging” environment. Air Mauritius reported an operating loss of EUR479,000 in the quarter and stated that operating costs increased 19.6% to EUR123 million, with Air Mauritius, like most carriers globally, feeling the pain from higher fuel prices. Air Mauritius’ financial situation has been deteriorating for over a year now, with the CEO on each occasion remarking on the affect of fuel prices and financial turmoil, although the most recent remarks are the strongest yet, as has been observed with other carriers. A partner would no doubt benefit Air Mauritius, but a tie-up is unlikely given the carrier’s relatively stable state and position as an end-of-line carrier. Air Mauritius should continue with its restructure, which will see European losses immediately stemmed, but gains from a renewed push into Asia will take some time to be realised. The carrier is positioning itself for the long term and must now ride out short-term volatile times, which it has previously shown itself capable of achieving. 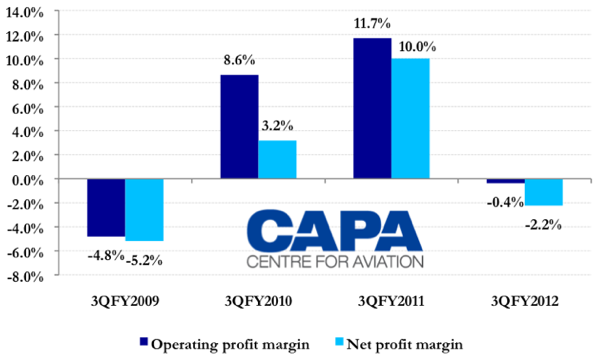 Update 23-Feb-2012: Air Mauritius projects a break-even in the financial year ending 31-Mar-2013 and a return to profitability in the subsequent year.